An embroidery hoop makes the stitching process easier and I find I produce a better result if I use one. I know many people dont like to use a hoop but I always encourage people to try it particularly if you have trouble with tension. 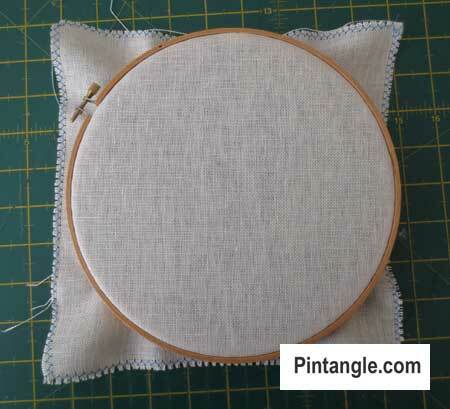 If your stitches pucker and pull the the fabric learn to use an embroidery hoop. Here is a tutorial on how to bing a hoop, what size to choose and tensioning a hoop. I know some people say a hoop is uncomfortable to use. However, often the hoop they choose is too large. 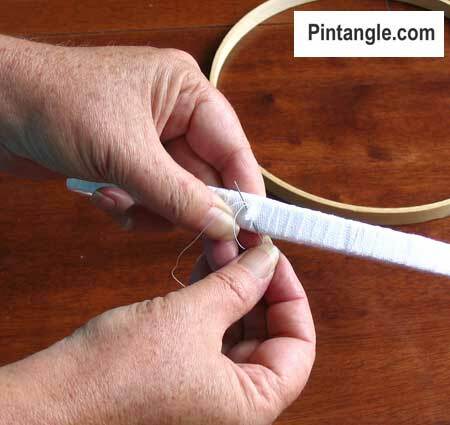 Unlike quilting hoops when you hold an embroidery hoop you should be able to easily place your index finger in the centre without strain. 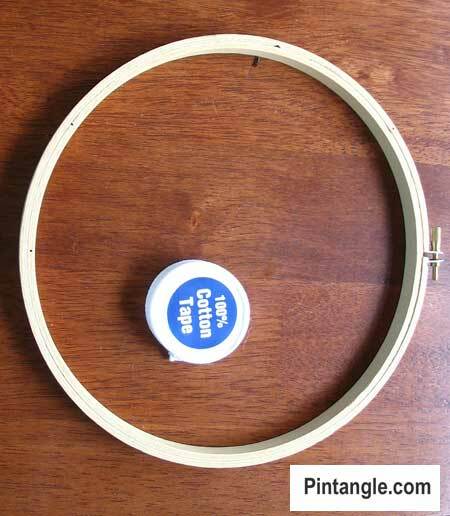 How to bind an embroidery hoop. Some people worry about a hoop creasing and squashing their work. To counter this only have your work in the hoop when you actually stitch, in other words don’t leave your work in the hoop over night. Also I have some tips at the end of the article about steaming your work. Always bind at least the inner ring of your hoop. This is called dressing a hoop. I know that term sounds Victorian but it is what binding a hoop is called. I know this sounds fussy but it is really worth while taking 20 minutes and dressing your hoop. Dressing a hoop is quite easy. You need some cotton twill tape, which can be found in the sewing haberdashery section of a fabric store. It is not expensive – a couple of dollars at the most. Make sure what you purchase is cotton. 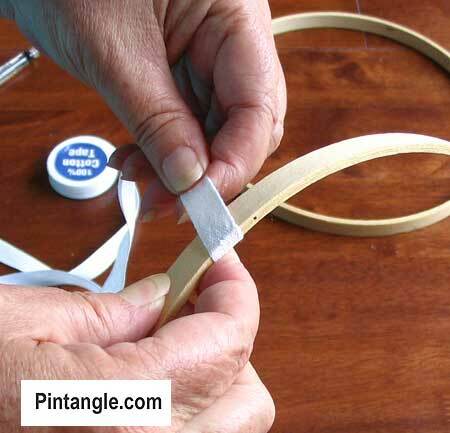 If you use a polyester or polyester mix tape your dressing will not have the same grip and the fabric you place in the hoop will slip. Since the idea is to control the tension of the fabric slippage undermines what you want it do. The process is a simple enough. Start off by tucking the end of the tape under the first wrap. Continue wrapping until you have the whole hoop covered evenly. Secure the end of the tape with a few stitches. 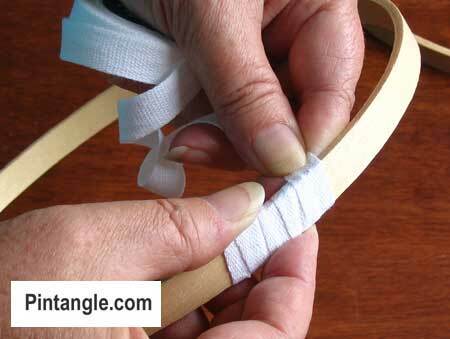 After you have wrapped or dressed your embroidery hoop this is how you use it. Yes dressing an embroidery hoop is the correct term – Victorian I know! 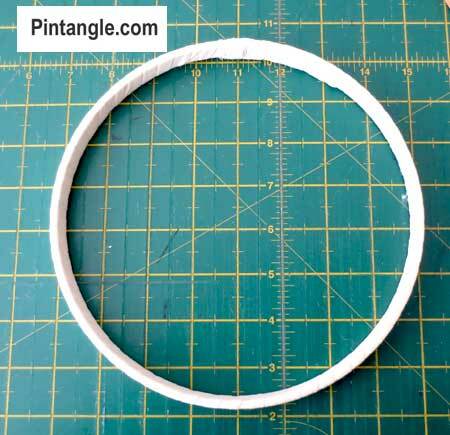 Lay the dressed inner ring of the embroidery hoop on the table and position your fabric over it centring your design or stitching area in the middle of the ring. Loosen the screw on the top ring to open it slightly and place it over the fabric and bottom ring. Have the screw mechanism sitting at about 10 o’clock if you are right handed. If you are left handed set the screw at 2 o’clock . This means you will not tangle your thread around the screw closure. It is very frustrating to have your thread catch on it with every stitch! Tighten the screw enough so that it grips the inner ring and stays in place. 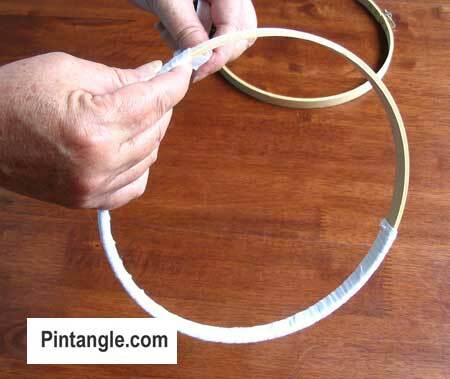 After placing your fabric in you hoop you need to tension it. For even weave embroidery where there is a lot of stab stitch involved ie you push the needle into the fabric and with the other hand push it back to the front you will need a tight tension on the fabric. If it is surface embroidery where there is scoop stitching involved allow a little bit of ease on the fabric. Let the fabric have a little flex. Not too much, just a fraction to allow you to scoop stitches should you need to and you can always tension the fabric by pushing it from the back with the middle finger on your non dominant hand. 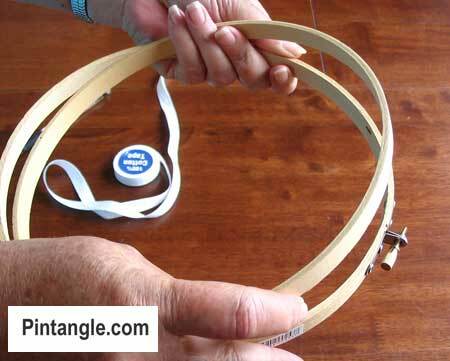 I see lots of people trying to do surface embroidery stitches with a hoop stretched drum tight. You should be able to take a bite of the fabric with your thread. Don’t tension the fabric so tight that it becomes impossible to manipulate the needle and thread. What if your work is too big for an embroidery hoop? If your work is too big for a hoop that fits your hand think about using a larger hoop that is mounted on a stand. This will leave both of your hands free to stitch. The other alternative is to use a frame. However I do have a confession as I often move a hoop along. For instance my band sampler is done this way I simply move it along and place the hoop over the stitches. Many embroiderers would have a fit at this, as they see it as squashing the stitches but honestly if you you use good thread it will usually bounce back and to be honest it does not cause me troubles. I usually just have the hoop on the fabric while I actually stitch. I also have the fabric a little slack and I will steam out creases the sampler if need be. If your embroidery becomes creased, particularly if it is something like silk ribbon embroidery. Hang it in a steamy bathroom to relax it. Peg your work to a hanger and take a hot shower with the exhaust fan off, then hang your work up in the bathroom. Another way of doing it, is hold the work over a steaming kettle. Keep your hands and arms clear of the steam, as you do not want a burn but hold the work there for a little while and steam it. You will find the fabric, thread and ribbon relaxes into its original shape. I hope you have found this article useful. Do you use a hoop? Do you have any tips for readers on using a hoop? What do you think are the key advantages and disadvantages to using a hoop? I have a Duchess 9″ oval hoop that was my mothers…circa 1950’s ? I love the shape but it is too loose to hold my work snugly. Thank you for the ‘Dressing” info. I’ll get it ready for the first lesson. I’ve never heard the phrase “scooping my stitches”…what is this action? I have a hoop passed down to me that is bound…I didn’t know the purpose of binding and enjoyed the information greatly…I move my hoop around also. Jeannie if that hoop is wood hand on to it like crazy like it is gold! Many of the modern hoops sold through the big chain stores are made china and laminated ie two or three bands of wood glued together. They are not good hoops. I have my own personal theory that one of the reasons people dont like hoops is that many of the modern hoops are simply bad products. Unless you seek out very good hoops in specialty stores, and probably pay at least 5 times the price for something that looks similar but it not, you end up with a bad hoop. However telling someone new to embroidery that their hoop is not good enough comes across like an old school teacher and everyones nightmare of the fussy needleworker. So hang on to that hoop! KBSalazar, just Love the pencil eraser idea for the screw – extremely clever and creative. Bet your work is, too! In the US, bias tapes sold pre-cut on cards are almost all polyester, but I’ve had no problem at all finding all-cotton twill tape sold by the yard. It usually comes in a couple of widths. I look for stuff no more than 1/2 inch wide for binding my hoops. A second source for the stuff if it’s not in sewing stores near you would be mail order. Note that it’s used extensively in museum and archival work, and will be available from those specialty retailers in addition to more traditional sewing notions suppliers. kbsalazar thanks so much for taking the time to let me know that cotton twill tape can be purchased from sewing notion stores – we would call them haberdashers here in Australia – and that it can be purchased by the yard. Bindings in American Stores are not all synthetic. All my LNS and chain shops like Michaels and Joanns all have 100% cotton twill tape for use in binding hoops. Maybe it is just where you live, idk. Thanks for the tutorial, Sharon, I love all the attention to detail, that is the mark of an artist. That is where the unmistakable classic result comes from. 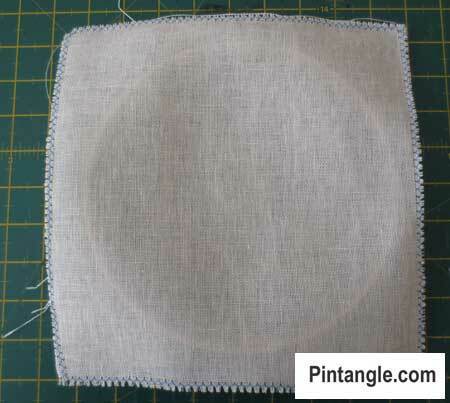 I keep several hoops wrapped for embroidery but I use medicinal gauze for binding. The gauze can be found in the first aid section of drug stores or pharmacies. The gauze leaves a thinner wrap than the twill tape. Additional thoughts for hoop use. 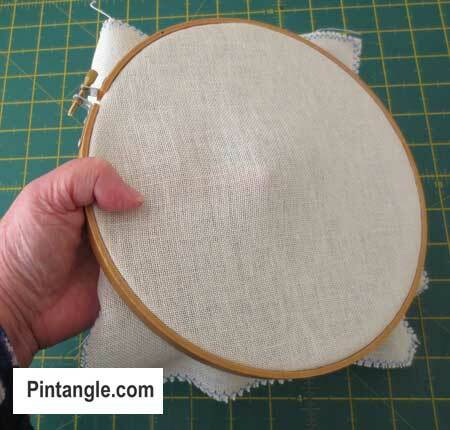 If you find yourself having to hoop over completed stitching, instead of forcing the hoop down over the stitched area, position the hoop over it, then carefully compress the opposite side. Likewise, do not tug the fabric outside the hoop to increase tautness in a way that draws completed work back under the hoop. 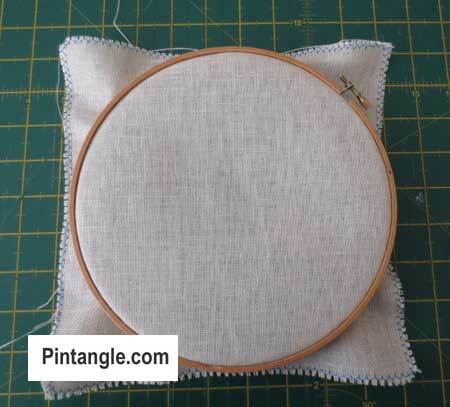 By not sliding the hoop over completed stitching you minimize damage to the work in progress. Yes – there will be compression, but friction under pressure is even worse. Avoid hooping over friable threads like wool, or heavily raised/textured stitches. Like Sharon, I hoop over flat stitches all the time in the course of working band and other samplers, but if I have a knot stitch accent, I will wait until EVERYTHING else is completed before placing those, so that subsequent work won’t crush them. Drum tight works best for stabbed stitches, like double running, but also like Sharon advocates, I’ll re-hoop looser for working sewn stitches, like chain stitch outlines around blackwork style fills. I try to take my hoop off when I put my work down for the day, unless I think the stress of re-hooping outweighs the stress of leaving it mounted. Finally, I had a hoop that for some reason, always seemed to catch working threads on the screw, no matter where I positioned the screw while holding it. I tamed that annoyance with one of those plain pink pyramid shaped erasers that slide onto pencil after the original eraser is rubbed bare. I stuck that over the screw head, and worked happily away with fewer snags. kbsalazar thanks for the additional tips – although I hoop over textured stitches too as steam brings them up again. My only suggestion would be that instead of the stitches securing the end of twill tape being on the outside of the inner hoop as shown, that final join be positioned so that the twill tape wrapping terminates on its inside. Any securing would also take place on the inside of the hoop. That would minimize the possibility of a forming bump or high spot on the contact surface of the inner hoop, and any inconvenience resulting from that bump during use. Thanks for this lesson,it has restored my enthusiasm for the hoop,I had my fabric way to tight,I now realise,too easy now! Grateful as always Sharon???? Great post Sharon ! I am a hooper too and love them! I bound my first ones 25 years ago and they are still going strong. In class I always offer people to try one of mine- it’s interesting how often they like it – once they really understand how to bind and use it. I stitch like you , moving my hoop and taking out the fabric when not in use. I’ve never had any problems with squashed stitches either :). I’m not really a hand embroiderer but have been trying more lately and getting lots of tangling of threads on the screw and I’d never even thought about the position of it. It makes such sense! I have never tried scooping stitches in the hoop; I always use the stab method which is slower so I might have to try scooping on a sampler. thanks Sharon for all the inspirations. Never thought about the position of the screw before! I have used strips of cotton fabric scraps for ‘dressing’ my hoops.